The short video, released online Sunday afternoon, sees Premier François Legault break down the details of Bill 21. 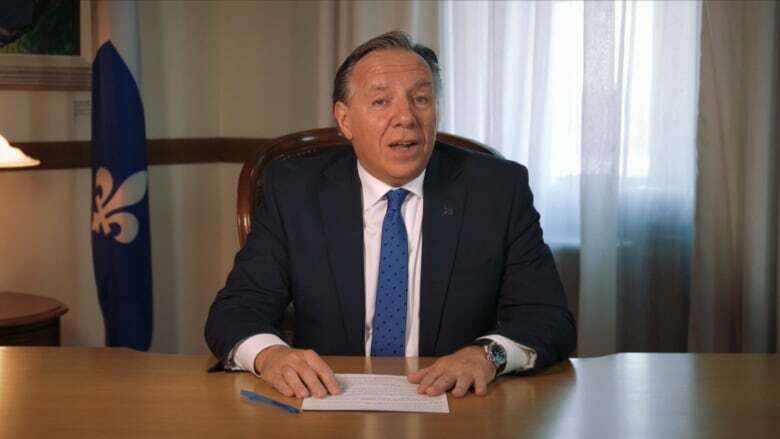 Premier François Legault addressed Quebecers directly on Sunday afternoon, releasing a pre-recorded two-minute video defending his secularism bill to the public and explaining how it will work. Bill 21, entitled "An Act respecting the laicity of the State," was tabled at the National Assembly this week. "Some people will say that we are going too far. Some will say, we aren't going far enough. In reality, this bill is moderate, just like Quebecers," he said. NOTE: Turn on video captions for the English translation. Trouble watching on mobile? Watch on Youtube (in French). After several attempts by previous governments to introduce similar legislation that would ban religious symbols in the public sector, Legault said it's time to put the debate to rest. "In Quebec, it's been a long time since we decided to separate Church and state," he said. "And it's been more than 10 years that we've been debating religious symbols. It's time to nail down the rules." Legault said in the video that the law is not intended to compromise religious freedoms, but added that the preemptive use of the notwithstanding clause will "avoid long legal battles." Three successive governments have tried and failed to pass a law addressing religious neutrality. Despite claims from religious groups and civil liberties advocates calling the move discriminatory, Legault says that's simply not the case. "Each person will remain free to practise the religion of their choice, but we need to solidify the rules and that's what we're doing," he said. Since the bill was tabled on Thursday, a number of groups have voiced criticism and come out against the Coalition Avenir Québec proposed legislation. On Saturday, opposition party Québec Solidaire members voted to adopt an official stance opposing any restrictions on wearing religious symbols in public. Municipalities, including Westmount and Côte Saint-Luc, as well as the English Montreal School Board and the Lester B. Pearson School Board, have also signaled that they will not comply with the law if passed in its current form. It's unclear what will happen if they don't comply.